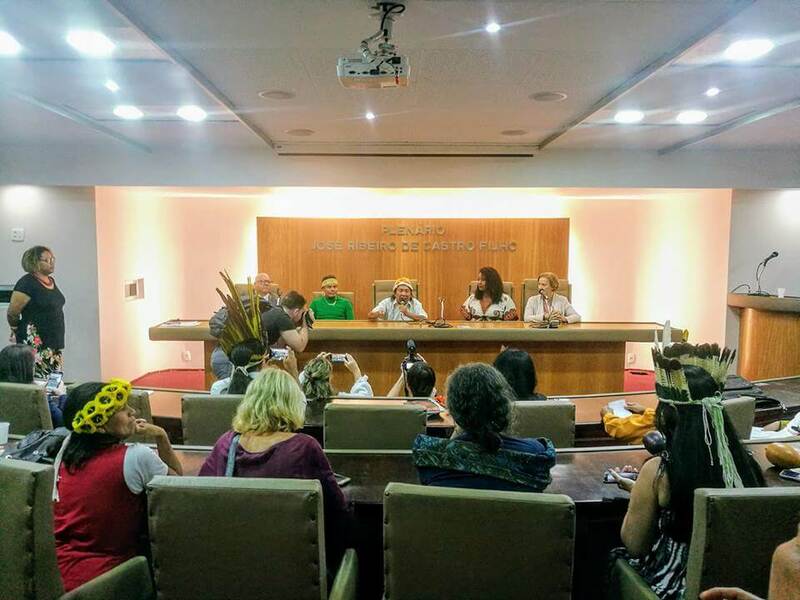 Last Thursday, May 17, Indigenous Peoples of the Brazilian state of Rio inaugurated the State Council for Indigenous Rights (Conselho Estadual dos Direitos Indígenas, CEDIND) at the Brazilian Bar Association (OAB) building in the city center. 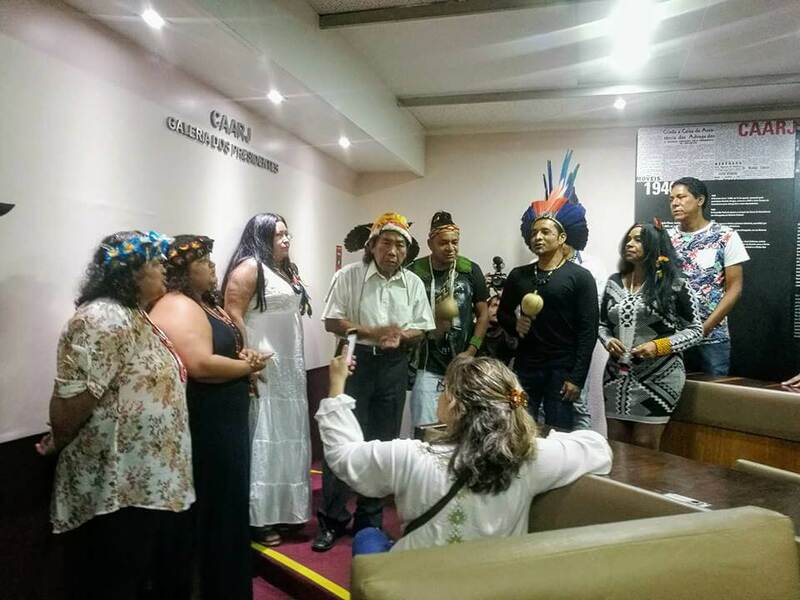 The ceremony gathered long-term indigenous activists and younger generations, marking an important milestone in a long history of Indigenous struggle in Rio de Janeiro. The Council’s mission is to guarantee the visibility and well-being of Indigenous Peoples in the state of Rio, be they in rural or urban areas. It will do so by strengthening networks among them and defending their interests, proposing public policies and government initiatives in a range of areas such as environmental protection, education, health, housing, and land rights. The Council is the result of Rio’s grassroots Indigenous mobilizations, of which the well-known Aldeia Maracanã occupation (2006-2013) was a key element. “The Council is a collective struggle and belongs to all of us,” Marize Guarani noted. 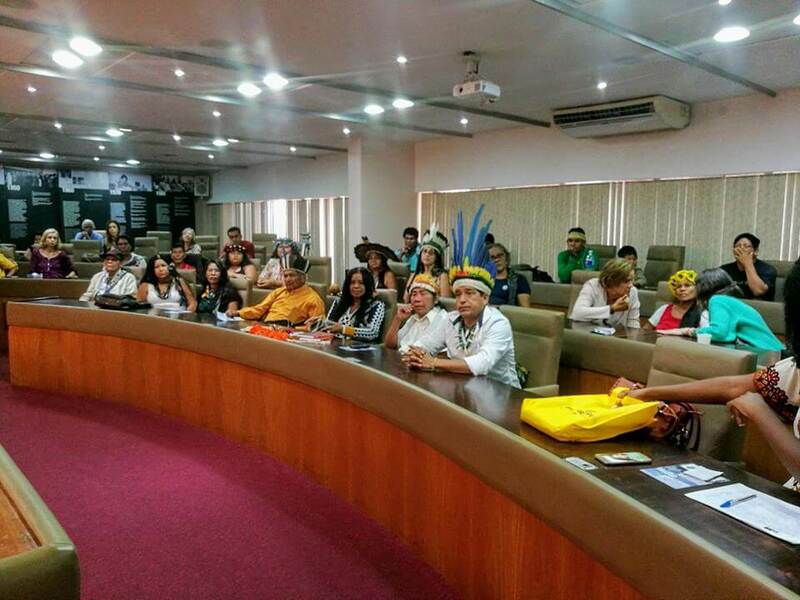 Attendees at the launch nominated Indigenous organizations based in the city of Rio to occupy half of the Council’s seats. These organizations included the Indigenous Association Aldeia Maracanã (AIAM), the Indigenous women’s network GRUMIN, the Puri Resurgence Movement, the Institute for the Knowledges of Original Peoples Aldeia Jacutinga (ISPOAJ), the Reference Center for the Culture of Indigenous Peoples—Aldeia Maracanã, and the Latin American University Association (AULA). Representatives from Rio’s Indigenous Guarani and Pataxó communities occupy the other seats. In respect to indigenous customs, the nomination of the latter group of representatives was an internal decision of each community and its leadership. Breaking with the original plan, which determined that the Council would elect one president, the Indigenous attendees elected two presidents to reflect the realities of rural and urban Indigenous Peoples. Carlos Tukano, currently president of the Indigenous Association Aldeia Maracanã, will represent Indigenous Peoples living in the urban context. Nino Wera’i, vice-cacique (vice-chief) of Rio’s Guarani Araponga community in Paraty, will represent the rural Indigenous communities in Rio de Janeiro. The suggestion came from writer and activist Eliane Potiguara. “We do not have to follow the rules of the non-indigenous, we can create our own leadership,” she stated to the group, when the two candidates were nominated to run for president. “I can see that we have two types of groups here, one from the city and one from the rural communities. So I suggest that we break the rules here, for we are the priority in this Council,” she proposed as applause broke out in support. This move reflects the Indigenous way of solving a potential conflict by compromising, listening to the ‘other,’ and spotting an opportunity for dialogue and unity where others may have seen an impasse. Through its representatives, the Council will connect the range of Indigenous initiatives and groups in Rio to relevant government bodies, including state and municipal secretariats such as the Special Secretariat for Racial Equality and the State Secretariat for the Environment, as well as to a number of Rio’s public universities and the Public Defender’s Office. The State Secretariat for Human Rights and Policies for Women and the Elderly (SEDHMI) will coordinate the State Council for Indigenous Rights. “This Council began, practically, in Aldeia Maracanã,” affirmed Afonso Apurinã. From 2006 to 2013 Aldeia Maracanã was an Indigenous occupation of the abandoned building of the former Indigenous Museum, which moved to Botafogo in the 1970s. People representing different indigenous ethnic groups entered the building with the mission to centralize their growing movement in one location, create an indigenous space of collective living and housing, and bring visibility to Indigenous Peoples in Rio. At the federal level, Brazil still does not officially recognize or attend to the specific needs of urban Indigenous Peoples, while Indigenous communities continue to struggle against government neglect, dispossession, violence, and marginalization despite the promises of the 1988 Constitution. The Council stands as evidence of the presence and political vision of Indigenous Peoples in Rio. The residents of Aldeia Maracanã were removed during the preparations for the 2014 and 2016 sports mega-events by former Rio Governor Sérgio Cabral. Before their removal in 2013, they were successful in saving the building from demolition by listing it as a heritage site and part of the group struck a deal with Rio’s State Secretariat of Culture to reform the abandoned museum and turn it into the Reference Center for the Culture of Indigenous Peoples and Indigenous University. The Reference Center will be managed in a partnership between the Indigenous Association Aldeia Maracanã, the State Council for Indigenous Rights, and Rio’s state government. An important item on the agenda for the Council, therefore, is to fight for the promised restoration of the building, which has so far not happened due to government budget constraints. Council co-president Nino Wera’i asserted that a priority issue for Indigenous communities in rural areas is education—in particular the training and pedagogic supervision of community schoolteachers. That demarcation is still incomplete for some Indigenous lands is another primary concern. In the city, several Council members stressed the importance of implementing Law 11.645, which makes Afro-Brazilian and Indigenous culture and history obligatory in school curricula. “Education is still Eurocentric, schools do not discuss Indigenous and black issues,” stated Marize Guarani. This priority is linked to the Council participants’ ongoing struggle to bring visibility to Indigenous memory and history in Brazil. In the area of health, the specificity of Indigenous Peoples, their types of knowledge, and their healing practices are other issues to be discussed. In addition, Carlos Tukano highlighted the lack of employment, professional training, and higher education opportunities for Indigenous Peoples in the city. The Council engages different government bodies to discuss and attend to these varied demands. 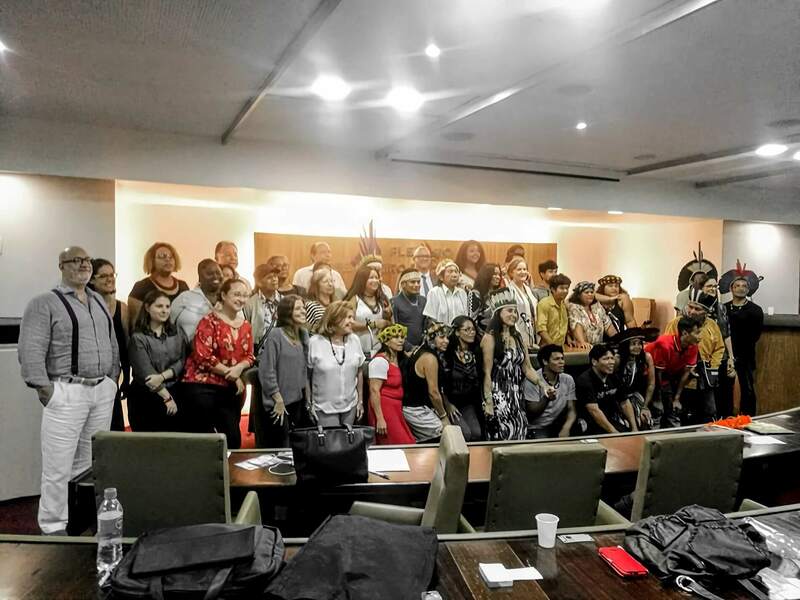 The Indigenous representatives highlighted their commitment to strengthening networks among Rio’s urban and rural Indigenous Peoples to bring visibility to their realities and give voice to their needs. “This Council is born after 518 years of the genocide of Indigenous Peoples,” environmentalist Sérgio Ricardo pointed out. It is one more step towards showing that Indigenous Peoples are here to stay, and that they will fight for what is rightfully theirs as the original peoples of Brazil. This article was originally published at Rio on Watch. It has been re-published at IC under a Creative Commons License.